Content Management System aka CMS offers ease and flexibility in managing content on websites. The CMS developers at WeblinkIndia excel in utilizing essential elements for effective CMS web design and development. They bring years of experience and expertise in diverse CMS to the table with their CMS website development services. Our CMS solutions cover CMS design and development of all the leading systems like WordPress, Joomla, Drupal, and Magento. They add customization and flexibility to your website developed using any Content Management System. If you wish to set up an E-commerce store delivering a high-end shopping experience to the visitors, we can help with our Magento Website Development Services. The developers at this CMS website development company will provide you an attractive, highly customizable, easy-to-run Magento online store that attracts customers and scales up your sales. Starting an engaging blog or running a content-rich website, WordPress is a complete CMS solution with thousands of themes, plugins and widgets. Contact this CMS development company for WordPress Website Development and take home a high-performance, search-friendly, responsive website to reach, impress and win over your target market. Corporate website, personal website, E-commerce Store, professional blog, portal or any other online platform, Drupal, with its Graphical Flexibility, Structural Flexibility, SEO capabilities, and scalability, can power anything and everything. Get a Drupal Website developed by us, and take a step forward to digital evolution. A respected organization, Creative Financial, is engaged in offering different types of Loans including Loan against Property, Home Loan, Balance transfer & Top up Loans, Lease rental discounting, Commercial & Industrial property Loans and Unsecured Business & Personal loans. Create Fin is a Delhi & NCR integrated sales & marketing company that is powered by Creative Financial. We are involved in making available financial products & services. Moreover, we are acknowledged for our partnership with the renowned Indian & MNC banks as well as NBFCs companies. The website for Creative Financial is designed & developed by WeblinkIndia.Net Pvt. iPost Network, a fastest and safest transportation service provider that is also considered as India’s largest domestic delivery network company, is involved in rendering courier services, cargo shipment services, transportation services, logistics services, warehousing services and many more at very reasonable charges. 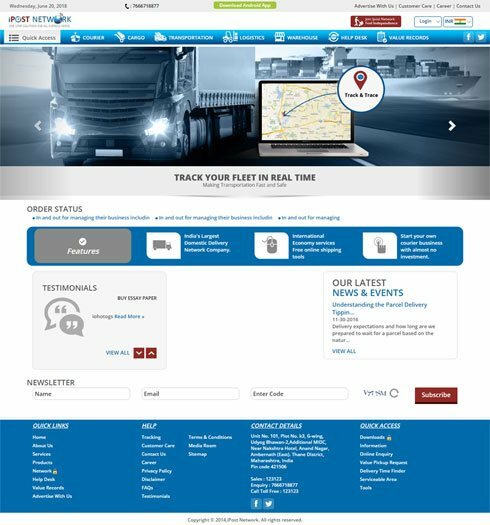 Our advanced system of tracking the status of the shipment convince our clients to remain associated with us for long as ensure safe and timely delivery at the desired location. We have a long list of prestigious clientele and business partners. Associate with us and check our website today. The website for iPost Network is designed and developed by a renowned company, named WeblinkIndia.Net Pvt. Ltd. The difference between: A dull, repulsive, outdated, outranked Website & A content-rich, high-performance, high-traffic, up-to-date Website Can be the: CONTENT MANAGEMENT SYSTEM. CMS is a sophisticated software package with a set of integrated tools to easily and quickly create, manage and publish web pages. The surge in the number of CMS-based websites can be linked to a host of benefits that follow. The biggest advantage of using a CMS is that Coding Skills are not required to maintain and update the website. The non-technical staff with a reasonable understanding of editing Word Files can create, edit and publish content on the website within minutes. CMS allows easy administration of the websites that demand regular content updates. For example, the non-technical content editors of e-commerce stores, blogs, etc. can easily log into a web-based administration panel to make changes automatically reflecting across the website saving website owners from hours of toiling. Given the fact that a CMS lets the website owners to directly update content on the website, without the assistance of technical personnel the web page goes "live" at a much higher speed. With quicker response time, your business gets a competitive edge. Right from influential themes, templates and modules, the CMSs come pre-wrapped with them providing towering graphical flexibility, structural flexibility, SEO capabilities and extensibility in designing and developing a website. Further, you can opt for personalized CMS web development services to cater your specific needs. You can generate particular user profiles and permit specific users to change certain segments of the website with CMS. Changes can go "live" automatically, or will undergo reviews for authorization. Without threatening content quality, you can engage diverse content contributors for the growth of the website. Content Management Systems allow easy installation of plug-ins and modules to extend a website's functionality. Be it integrating the website with your social media account or offering a number of payment gateway solutions, CMSs feature powerful modules to tailor your website specific to your business requirements. Our CMS web developers have over 10 years of experience in developing websites based on WordPress, Drupal, Magento, Joomla and scores of other popular Open Source Content Management Systems. The connected, empowered customers expect more than a just simplified way of content management. Our websites are based on CMS solutions that enable a complete customer experience management. As you learn and get used to managing content on your CMS website, we stay along with our excellent ongoing technical support for any query related to CMS web development. Email, phone, chat – all channels are open 24*7 for you for any assistance on our CMS solutions.